All students in Pre-K through 8th grade have art class once a week. Art students participate in art history, art production, and art criticism activities. Early Childhood and Primary grades focus on the process of creating art while experimenting with how art materials work together while painting, drawing, and sculpting. Elementary students grow as artists and begin to develop a broader understanding of the elements of art and the principles of design. Middle School students focus on observational drawing and developing a more personal artistic voice. All students also study artists and art movements through analyzing famous artwork, watching videos, and reading about artists. By analyzing the artwork of famous artists, their peers, and themselves; students learn the process of art criticism and evaluation. The Music program at St. Joseph School focuses on the development of the proper use of classroom instruments, as well as an introduction to note reading. Dancing and movement activities, as well as creative listening activities, are included in music lessons. Students are encouraged to display their creativity through musical performance, whether it is singing, dancing, or instrumental. Middle School students have the opportunity to join our Mass Choir which leads student masses. Our award-winning band program is open to students in fourth through eighth grades and is an extra-curricular activity. All band students take lessons once a week during the school day. Our beginner band practices as a group during recess and the Advanced Band practices after school. Parents who want their child to participate in the band program sign a contract directly with the Instrumental Music Program of Columbia, MD who sets all fees. Our band has received a Superior rating many times over! The Middle School Play and Talent Show are held in alternating years. These performance opportunities allow students to showcase their talents, whether on stage or behind the scenes. 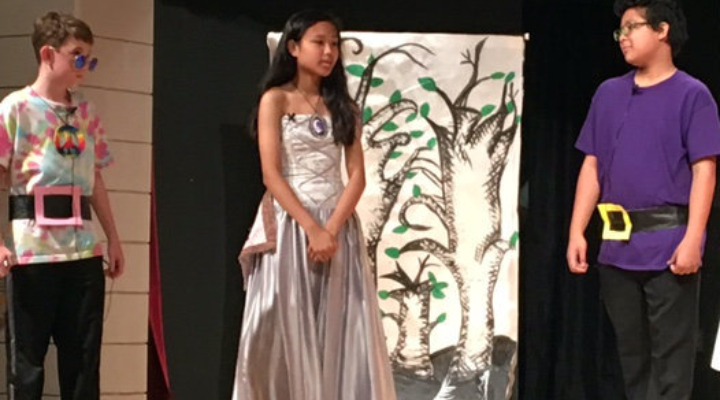 This year, 7th and 8th grade students performed a musical, "Princess Whatsername".